Learn English grammar with E-planet Educational Services. 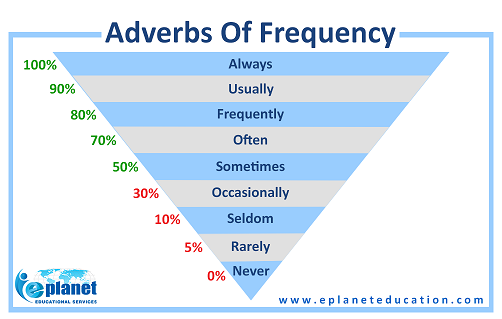 Today, we’ve got a post that will help you to learn about adverbs of frequency. When are adverbs of frequency used? Adverbs of frequency are used to describe how often something happens. Adverbs of frequency can be very useful when you want to talk about your routine. You can talk about how often you do certain things. Knowing these expressions also helps you as a listener to understand how often other people do things. What are some adverbs of frequency? I always brush my teeth when I get up. What about something that occurs some of the time but not all the time? For this we would use the word sometimes. I sometimes play my guitar in the evening. And if we want to describe something that doesn’t happen at all. The adverb of frequency used to express this is never. I never drink coffee after 5 o’clock in the afternoon. Of course, these aren’t the only adverbs of frequency. If you do something most of the time, but not always, you can use often, usually or normally. I usually eat breakfast before I go to work but sometimes I eat something on my way to work. Sometimes you might want to say that you do not do something a lot but you can’t say that you never do it. Then you would use hardly ever or rarely. How do we use the adverbs of frequency correctly? Remember to always put the adverb before the main verb. I brush my teeth in the morning. In this sentence the verb is brush. So the adverb of frequency must go before the verb. I always brush my teeth in the morning. If, however the verb is “to be” then you would usually position the adverb after the verb. He is rarely on time. He is often late. I don’t usually have time to exercise before work. Now try this out on your own and say how often you go out to eat, cook, wash your car, get a haircut, go to the cinema, have coffee, and exercise. You can use the chart above to help you!